One of us did not want to get into the water, so we decided to go with the mangrove tour. Sounded less exciting, but as we found out the next day, no less fascinating. With tour booked for the following day and car keys in hand, we’re all set for a relaxing 3 days in paradise! 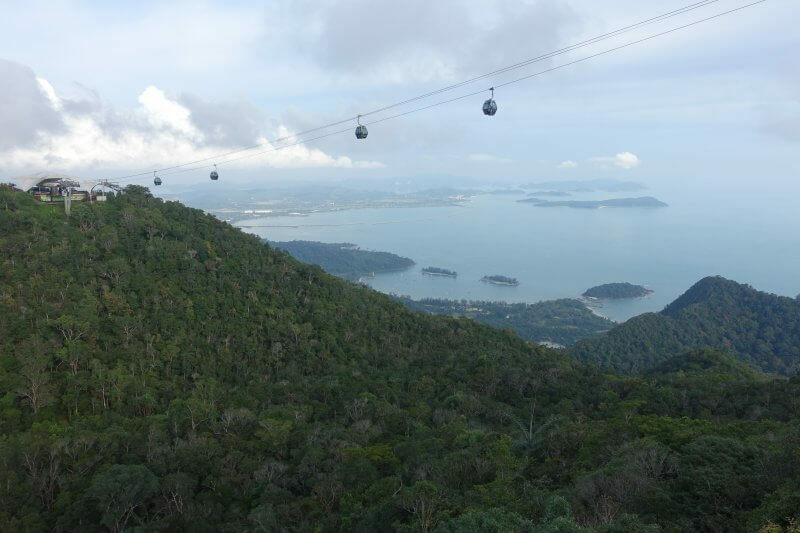 From Kuah Town, it is approximately 30km to get to Langkawi Skycab and Skybridge (or about 20km from Cenang). 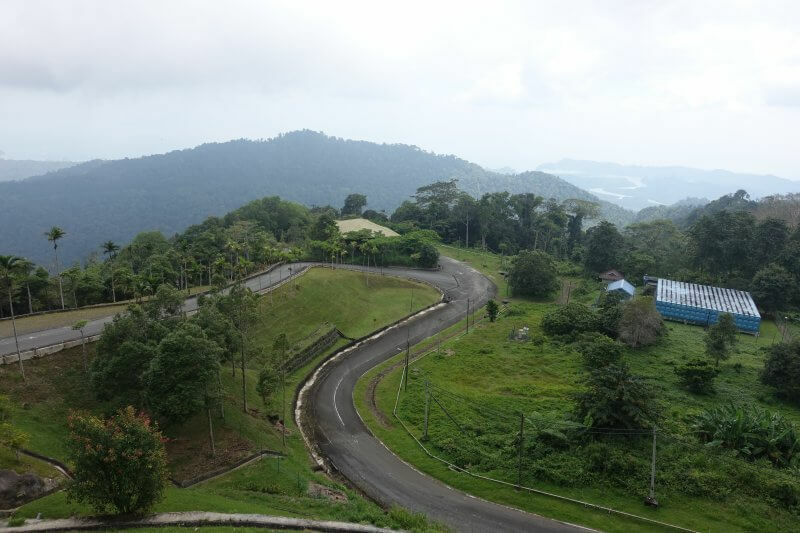 The roads start out long and straight but start to get steeper and windier nearing the start of SkyCab and SkyBridge. 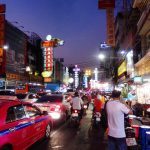 Finding a parking lot was straightforward enough, but getting to the ticketing booth was trickier, having to navigate through the ‘Oriental Village’, a tourist oriented series of shops and stalls which all visitors have to get through first. 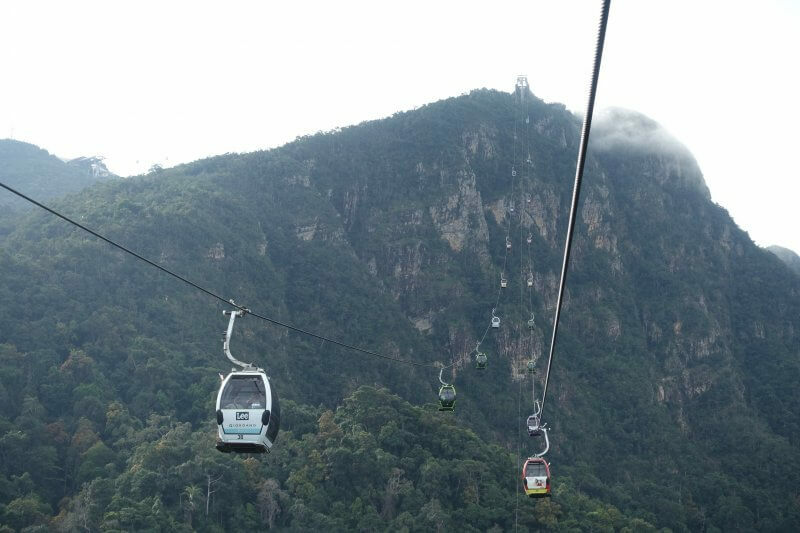 Tickets for the Skycab (cable car) to take you up Gunung Mat Cingcang cost 55RM, and happen to be inclusive of 3 other attractions, none of which is the one everyone came for, the Skybridge. 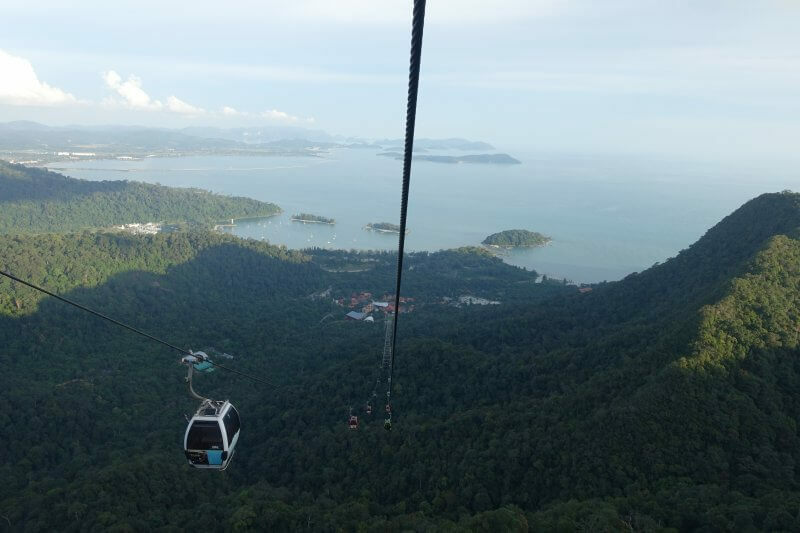 If you arrive earlier in the day you can make full use of your ticket to visit the SkyDome, SkyRex and 3D Art Langkawi. There are also tonnes of other attractions you can check out near the entrance of the Skycab, undoubtedly to capitalise on traffic visiting the SkyCab. There wasn’t much of a queue when we arrived around 5pm, so we got our tickets and were soon slowly soaring through the air on the 2nd steepest cable car ride in the world. The steep ascent, topping out at 42 degrees. The mountains were shrouded in thick clouds when we got off at Middle Station, and barely anything could be seen. After futile attempts to get any backdrop for our selfies, we decided that we might get better luck at the top station. Just as we were about to leave, the clouds started to clear. Even with thin clouds hanging, it was a majestic sight of the Strait of Malacca. Looking over the Strait of Malacca. 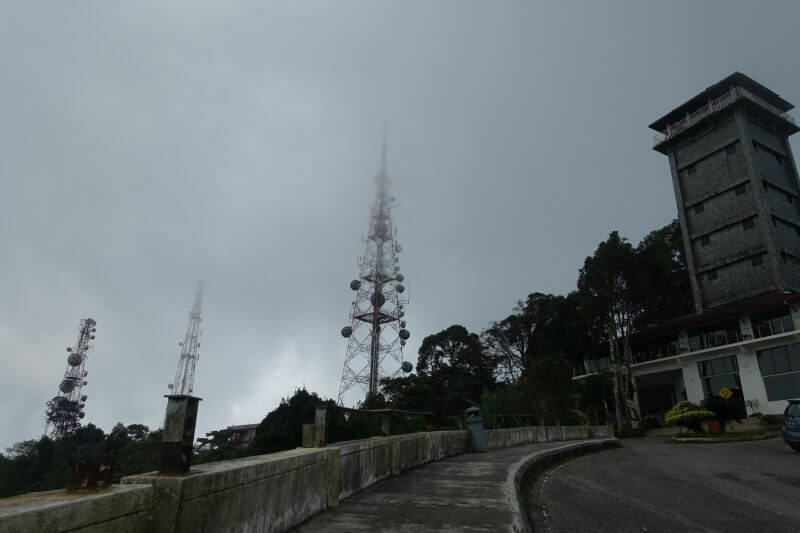 Blue skies awaited for us at Top Station, on the summit of Gunang Mat Cincang, 708m above sea level. 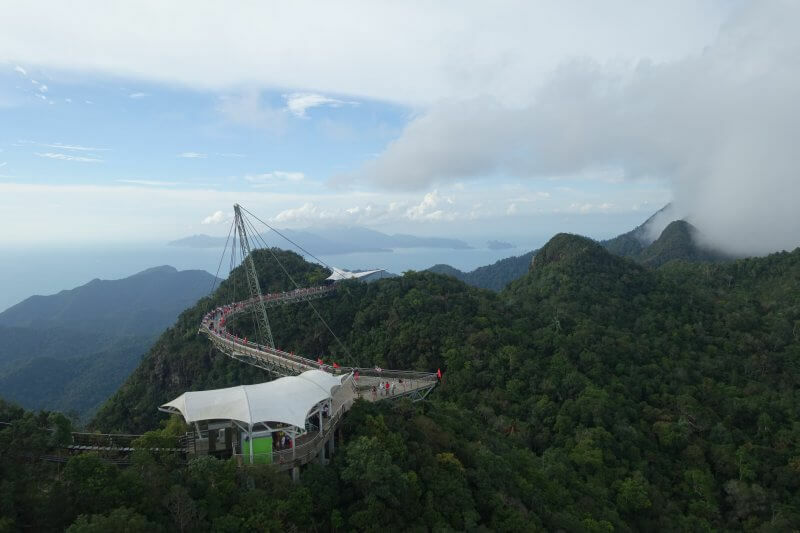 From Top Station of SkyCab, we could see the spectacular curved bridge that everyone came to Langkawi to see, set against the beautiful mountains in the range. Tickets to the SkyBridge can only be purchased at Top Station. 5RM for a 15 min walk to the start of the SkyBridge from Top Station, or 15RM to take sorta a lift/ gondola there. We decided to take a little exercise. The walk can get a little strenuous, but waiting to get on the SkyGlide looked like it might take more than 15 min when we were there. Approaching SkyBridge, from Top Station of SkyCab. Finally, after seeing this iconic bridge splashed over all sorts of tourism related material, this is the real thing! Maybe felt a bit shorter than I thought it would be, but nonetheless spectacular. Looked like quite an engineering feat, considering the surrounding terrain and design of the long, curved, free span bridge. 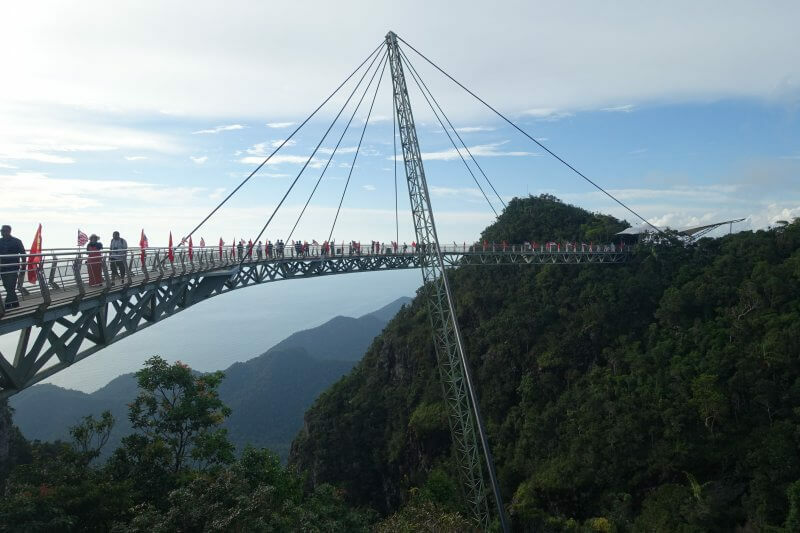 SkyBridge Langkawi, suspended 100m above the forest floor. Along the bridge, there are vertigo inducing glass windows. Would definitely not encourage those with acrophobia to look down, though I’m not sure if it would help much as there are hundred meter drops on both sides of this narrow bridge and there isn’t much else to look at. 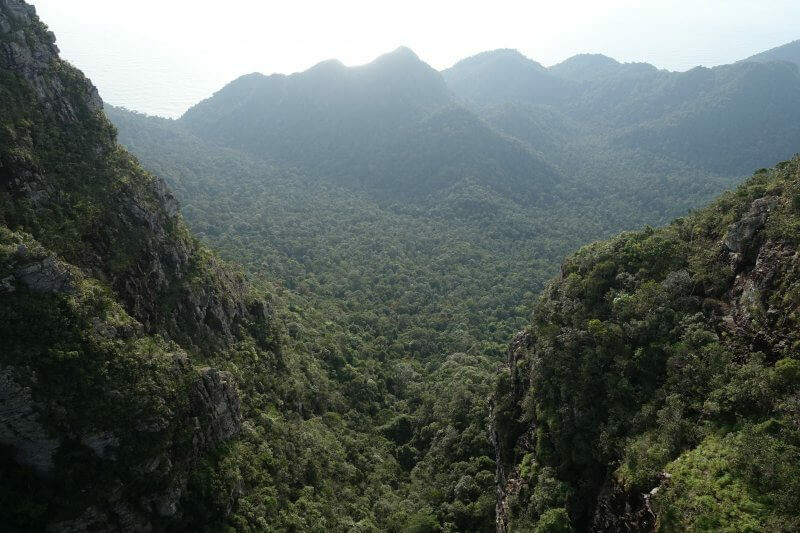 On SkyBridge, looking down into the lush valleys below. All around, hues of green and blue and green and blue, occasionally interrupted by white sandy beaches along the coast. Cable cars between Middle Station and Top Station, spanning 2 summits. 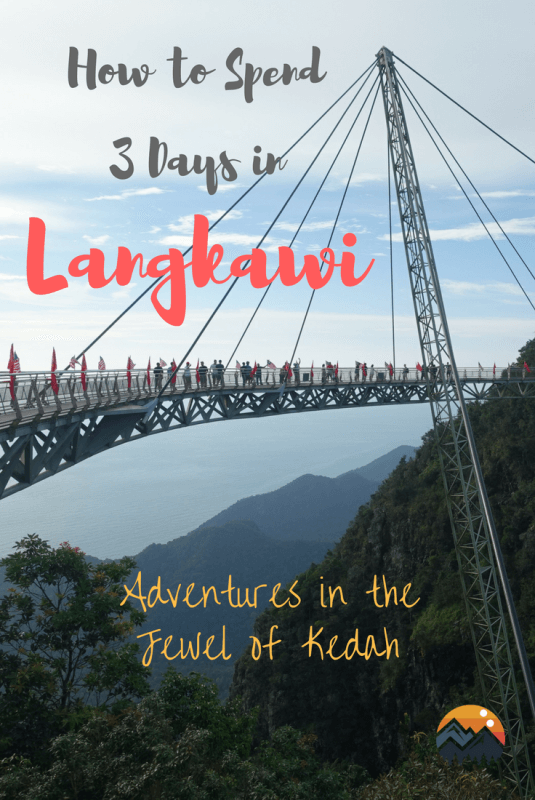 After about an hour trying to comprehend all that breathtaking scenery I didn’t know existed so near to Singapore, we started to make our way down to the foot of the mountain to continue our Langkawi adventures. 15 minutes, we were back down on the ground, and being down to earth folks, we next headed to Cenang beach, about half an hour away by car, arriving just in time for sunset. Jet ski and sea sports operators were packing up for the day, bars and clubs along the beach were just getting started. 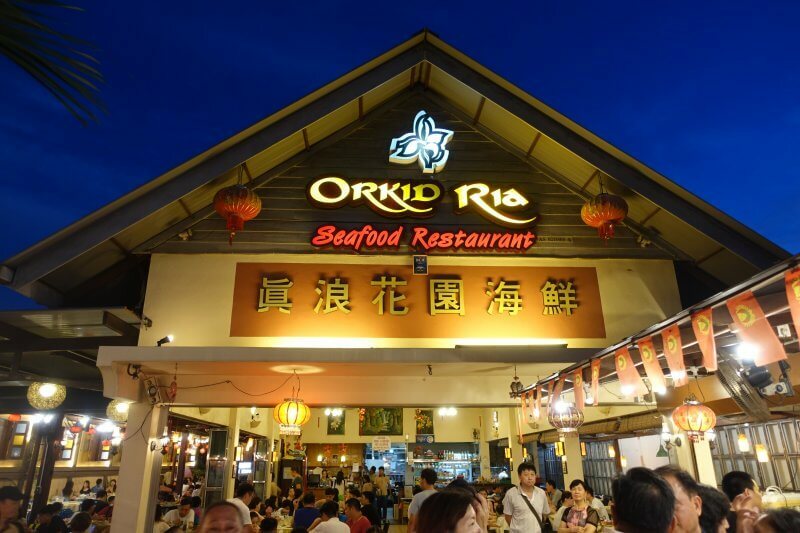 The coastal road was lined with restaurants, but we decided to check out Orkid Ria, which had garnered decent reviews. The place was packed, mostly with tourists. Overall, the place felt pretty tourist oriented, food was decent, but nothing too amazing in my opinion. Still preferred our usual JB spots. Good for a fuss free option though, won’t have to worry about getting ripped off and stuff. 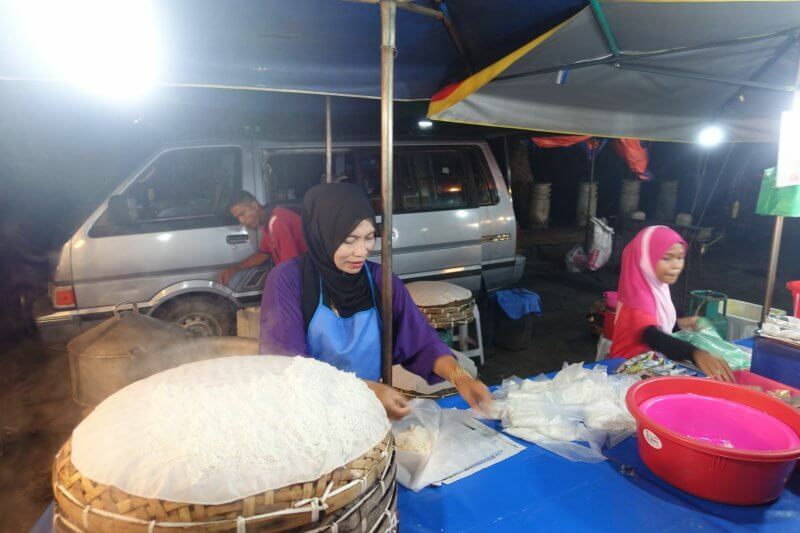 We had our fill and slowly made our way back, all ready for bed by the time we were back in Kuah. 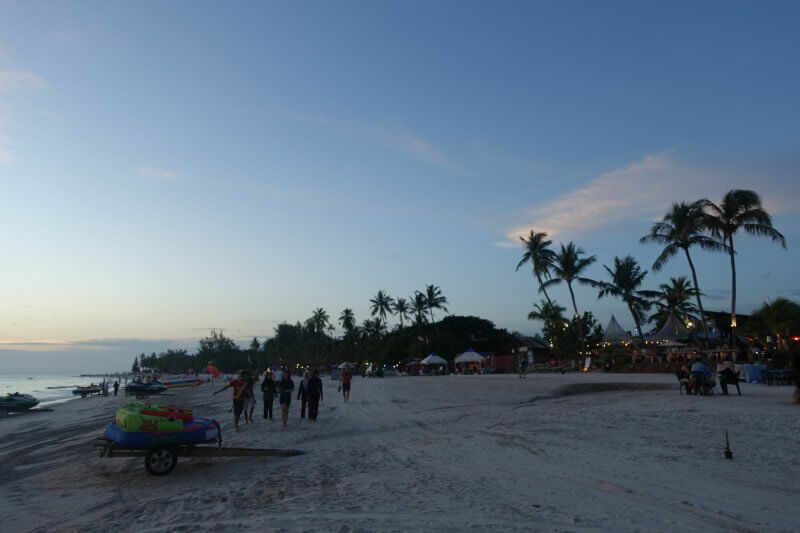 Thinking back, Cenang Beach area would have been a nice choice to stay too, it looked way more lively than Kuah Town. Anyway, the poor WiFi signal in our room made it an even easier decision to turn in early. 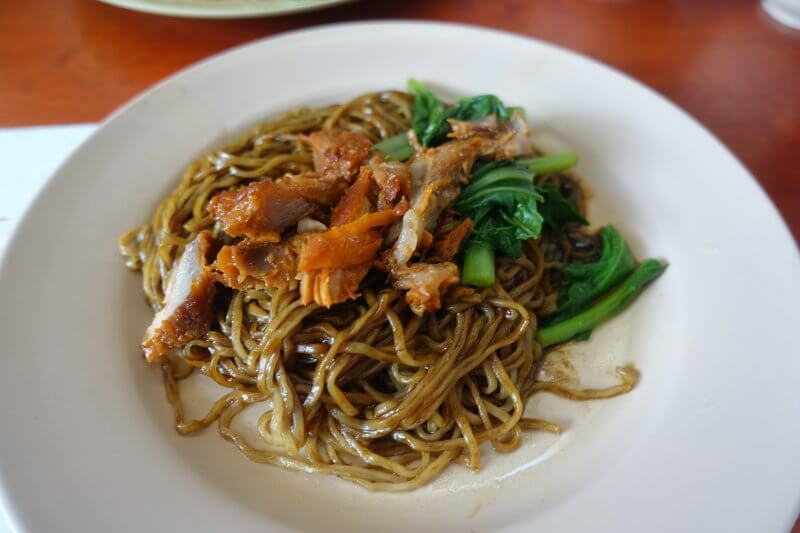 We woke up early, determined to get a local breakfast before embarking on our mangrove tour. 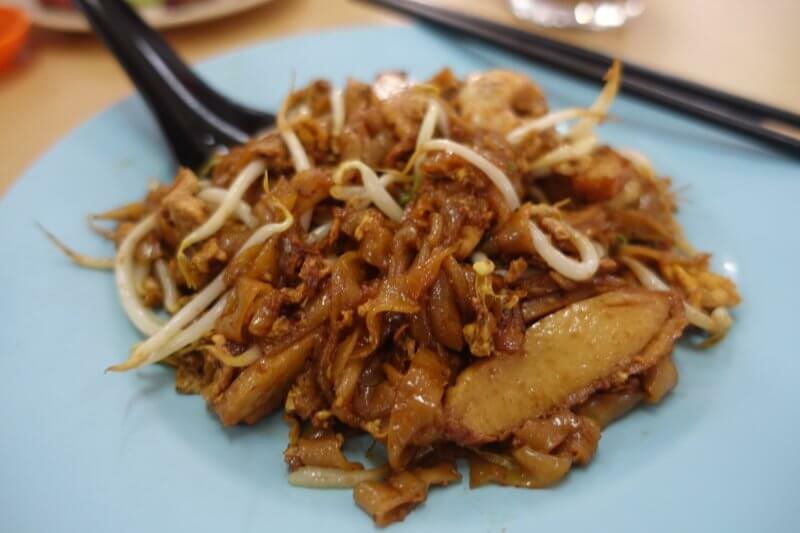 Not far from our hotel, we found Arked Pokok Assam 2, which housed a couple of stalls selling local dishes and snacks such as Wanton Mee and Roti Canai. 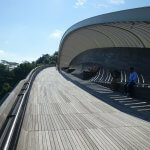 Well, local in Malaysia but possibly in Singapore too, as both countries share similar roots and cultural developments. 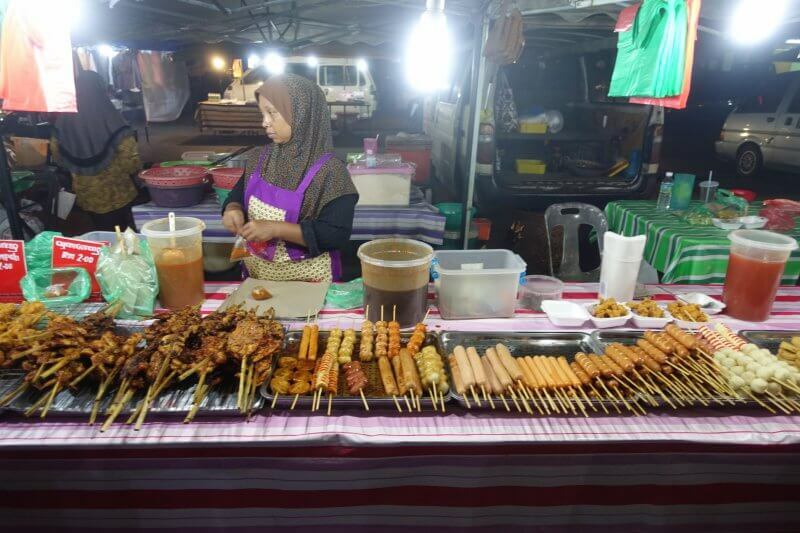 Still, over the years, tastes and cultural context diverged and you’d find nuances in similarly named/looking dishes across the Straits of Johor, and even throughout Malaysia, if you look hard enough. 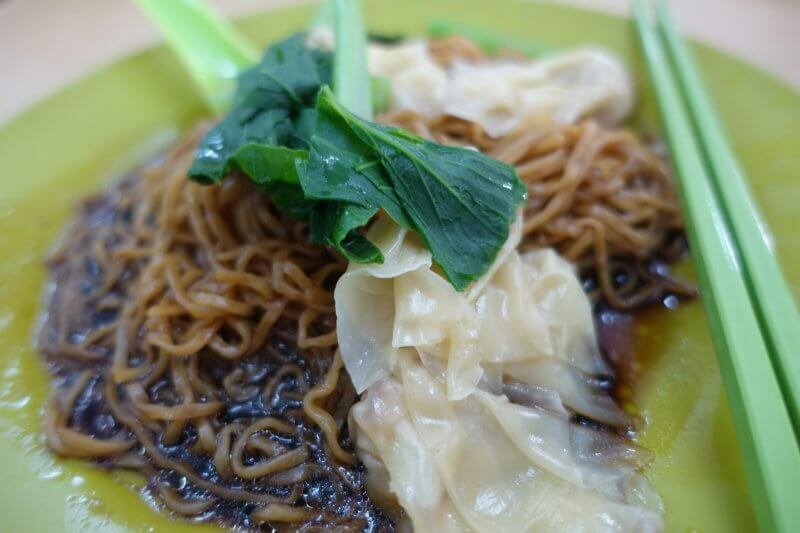 Wanton Mee, heavily laced with lard. Either love it or hate it. 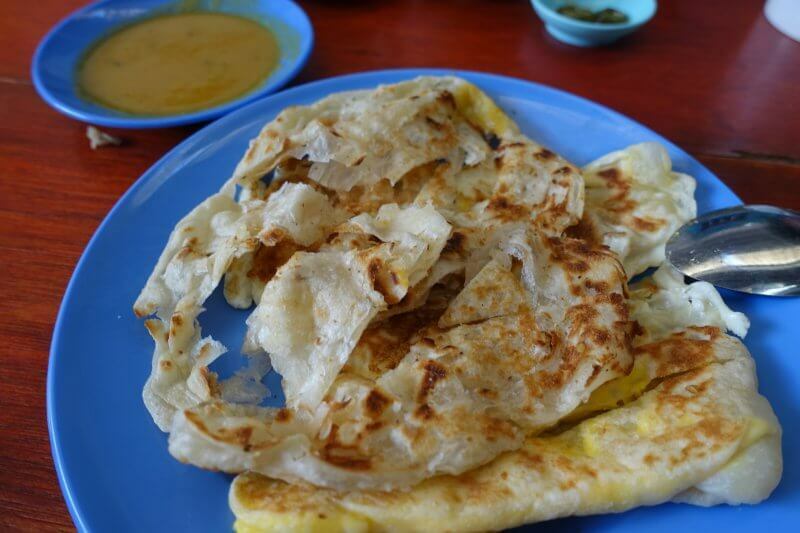 Roti canai, Malaysian counterpart to roti prata in Singapore. Well loved on either sides of the Causeway. The pickup for our mangrove tour arrived promptly at 9, but we weren’t that prompt. Nonetheless, we were soon on our way to the pier to start our mangrove tour of Kilim Geoforest Park. There were around 10 on the boat, including us. 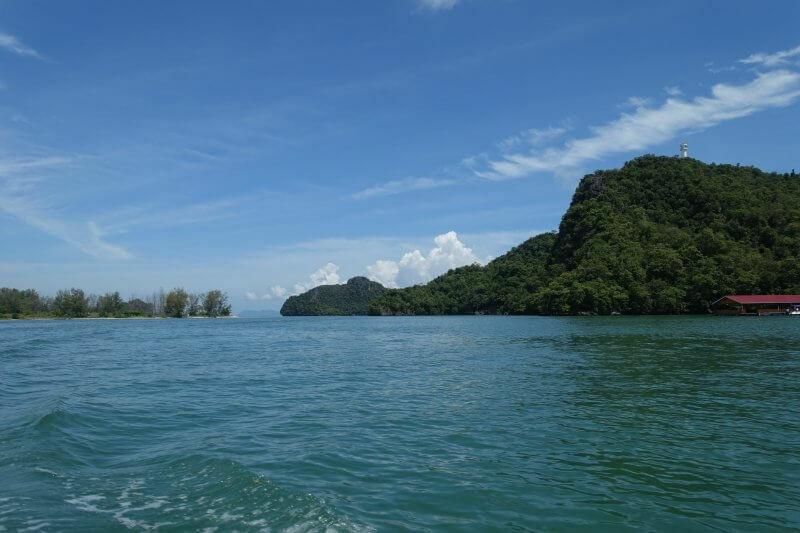 Starting out in fairly open waters, we were soon skimming across the water towards denser greenery and towering limestone cliffs. Our first stop was to watch an eagle feeding session. We can’t really tell what was being fed but someone in a boat stationed some distance away would throw some stuff into the water with every passing tourist boat, and the many eagles circling overhead (anticipating this moment) would dive down and grab whatever it was right out of the water in one swift motion. 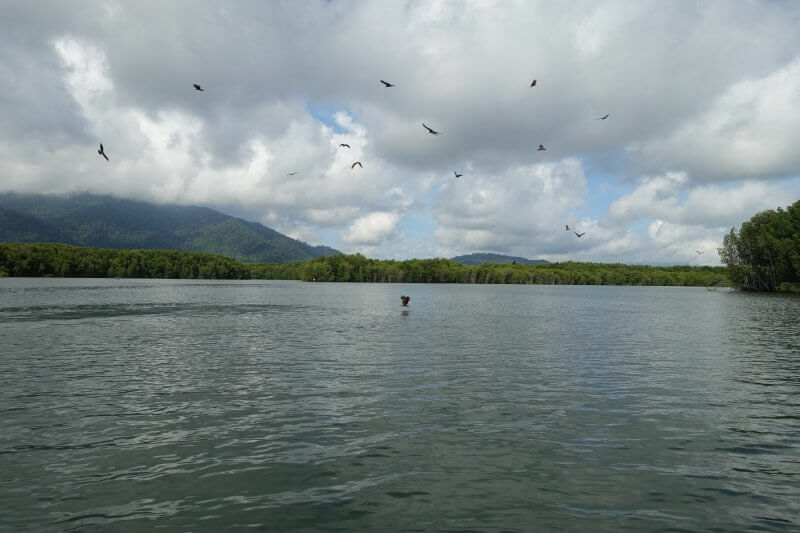 Eagle feeding at Kilim Geoforest Park, on the mangrove tour. 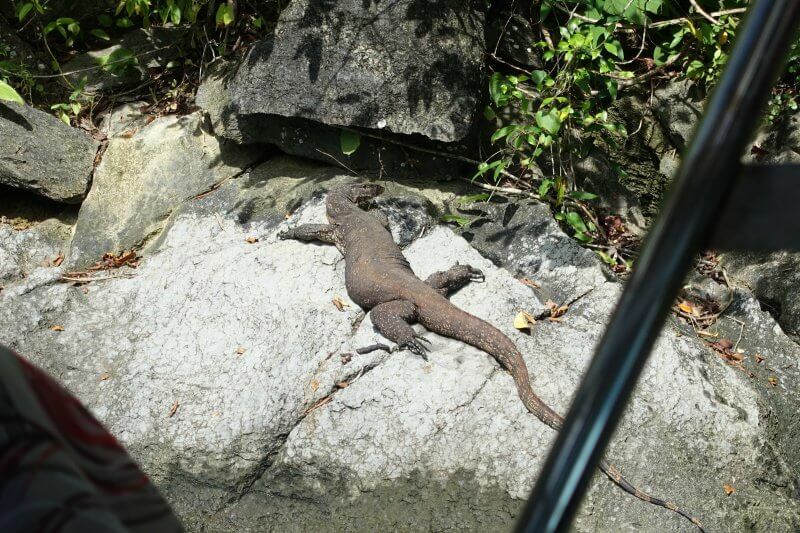 Along the way, HUGE monitor lizards were basking in the sun, and the boatman turned down his engine while slowly drifting closer in an attempt to get us a better view. Little by little, until he pushed his luck a little too far (or we got too excited), and the mini Godzilla scurried away. As the channel narrowed and vegetation got denser, the boat slowed down again for us to catch a glimpse of local monkeys in action. As with monkeys anywhere else, they looked really mischievous, and if you’d want to avoid any monkey business it’s best to inform the boatman that you’d prefer that the boat stayed further from the trees. Monkeys jumped onto a boat in front of us as they got closer, and chaos ensued. It was also around here that we saw schools of fishes (looked like Archer fishes to me) in the waters just beneath us. And deeper into the jungle we went. The little boat navigating through little channels in the mangrove. A few interesting stops later, we arrived at a pier in the middle of nowhere and were asked to disembark. 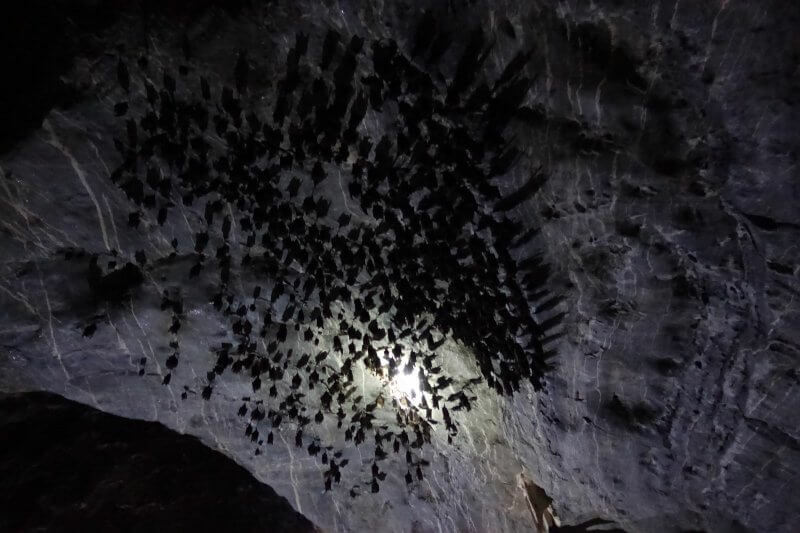 Following the crowds, we paid a small fee to enter a large cave which had its ceilings covered in bats. You can rent flashlights, but they weren’t really necessary. The pathway was visible, and the flashlight was mainly to see the bats. 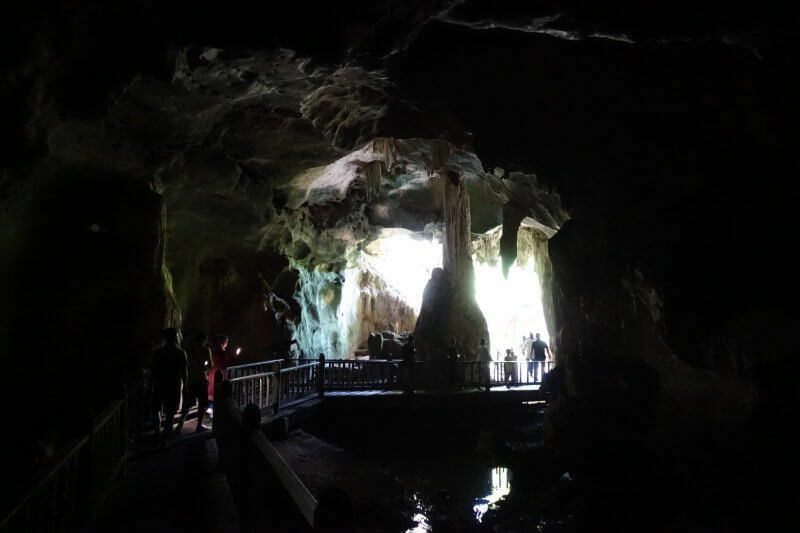 But since one in every few visitors would get a flashlight, you’d definitely be able to see the bats from someone else’s flashlight. In the cold, dark cave. Where’s Batman hiding? 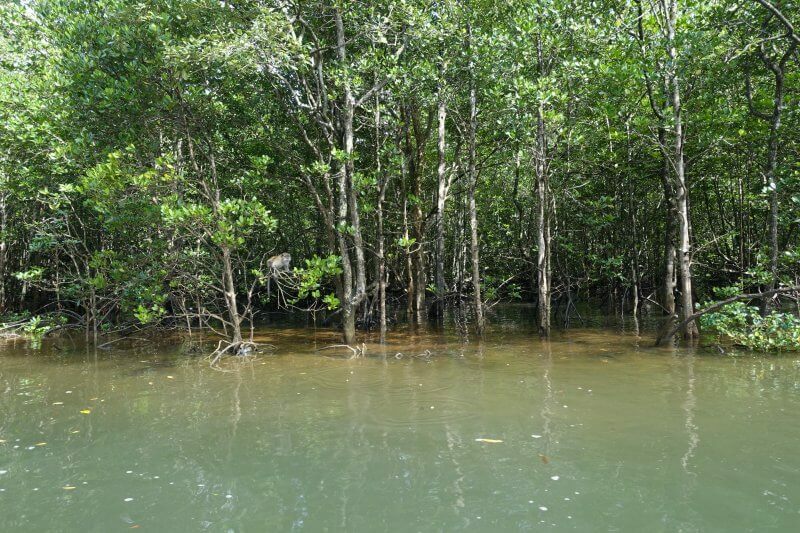 Emerging from the other side of the cave, you can walk through the boardwalk and get up close with the mangrove trees. And monkeys. 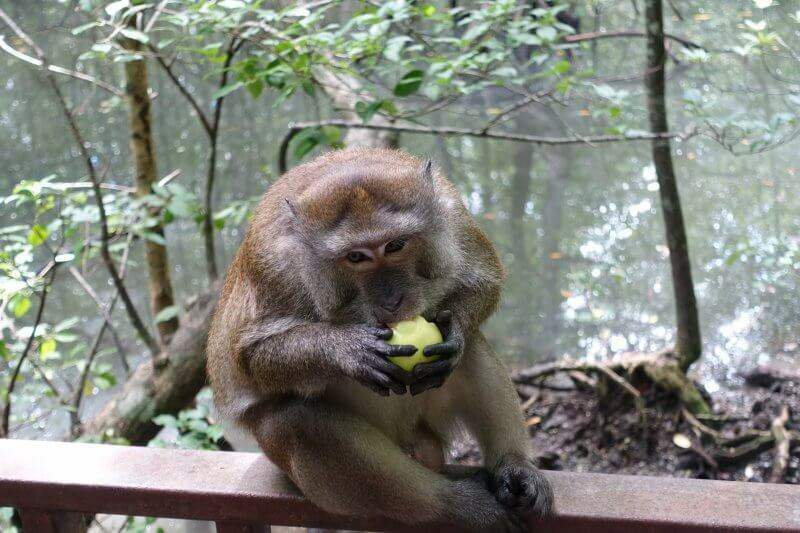 This monkey was really fat, and kept begging tourists for food. Or rather, it was probably the other way round. Unfortunately, the path is not a round trip, and you’d have to make your way back. This time, someone with a flashlight got it nicely in place as I was walking pass so I got a shot of these bats. 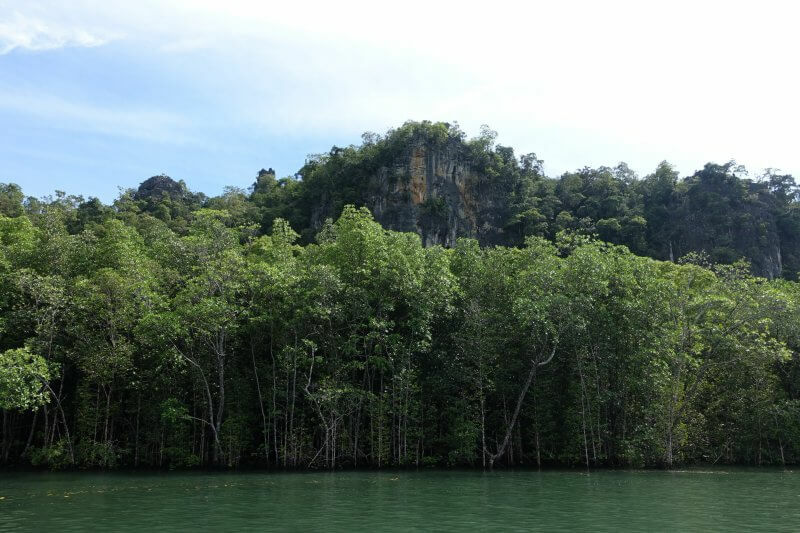 The Batcave was the last stop within the mangrove swamp, and the boat picked up speed, zipping through the narrow channels once more (much faster this time, our stomachs twisting and turning with the bends) till we were out in open sea, the Andaman Sea. The bumps as we bounced off each wave made it hard to take pictures, but the view of the untouched coast against deep blue skies were spectacular. 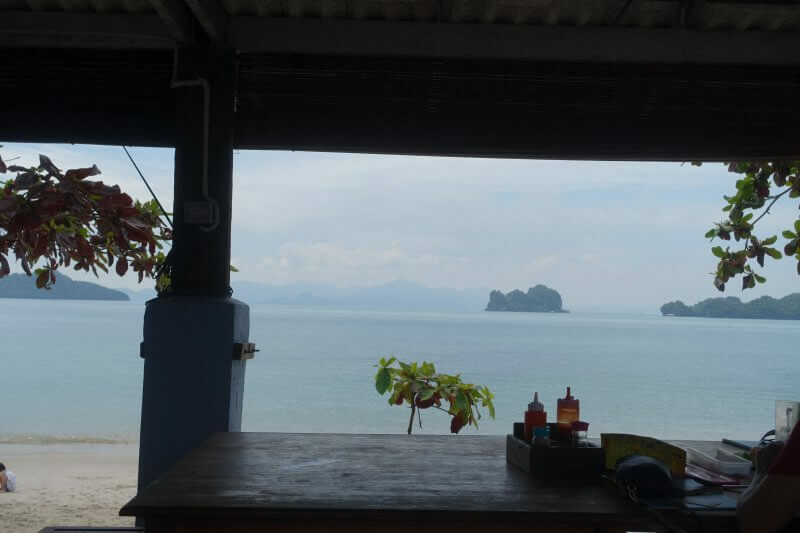 The boatman pointed to some islands not far away, ‘Thailand!’ he yelled, over the deafening wind. Not that we were going there though, but we were that close. 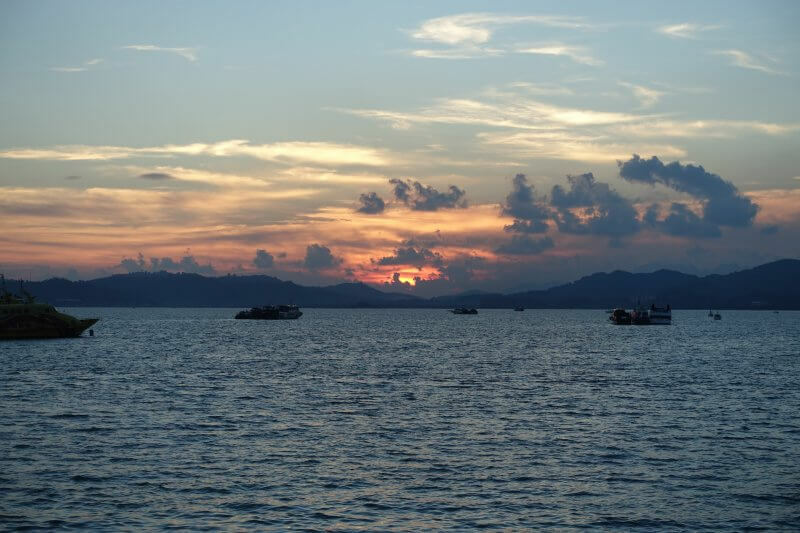 Not of Thailand, or of the Andaman sea, but somewhere close to the floating restaurant, after the boat slowed to manageable levels for photo taking. We finally stopped at a floating fish farm/ restaurant, where we had assumed it was to be a seafood lunch. What else could be served on a floating fish farm? But when the food arrived, we realised how far from the truth we had been: it was a plate of fried rice with a piece of fried chicken. 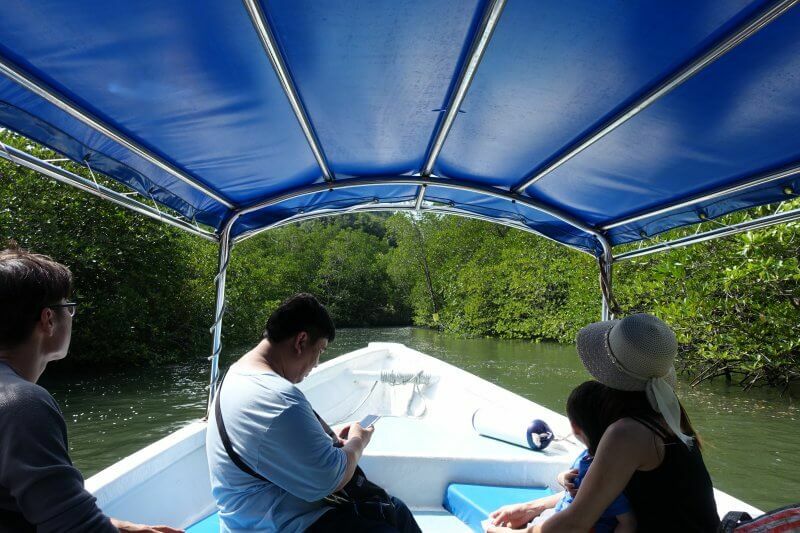 A word of advice, if you’d be joining one of these mangrove tours: ditch the included lunch and order some seafood, checking the prices, of course. 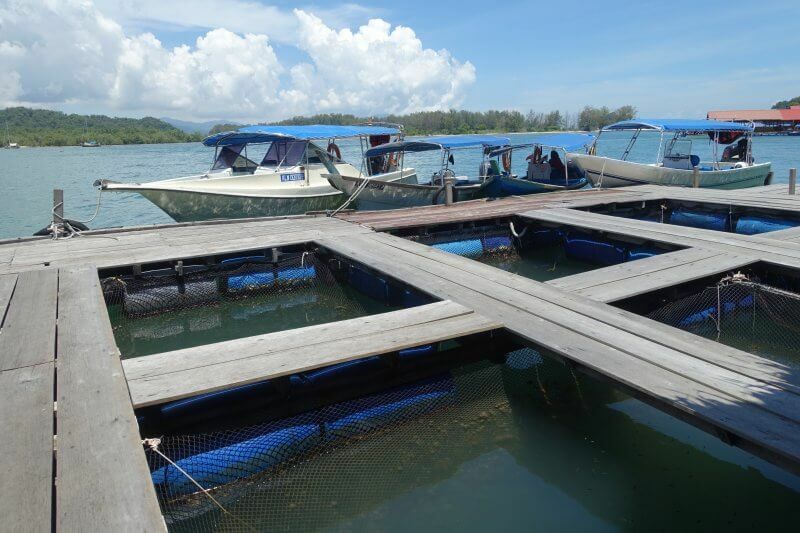 The floating fish farm/ restaurant, last stop of the mangrove tour. There were fishes and sea creatures of all sizes at the farm, and the feeding sessions were a natural crowd pleaser. 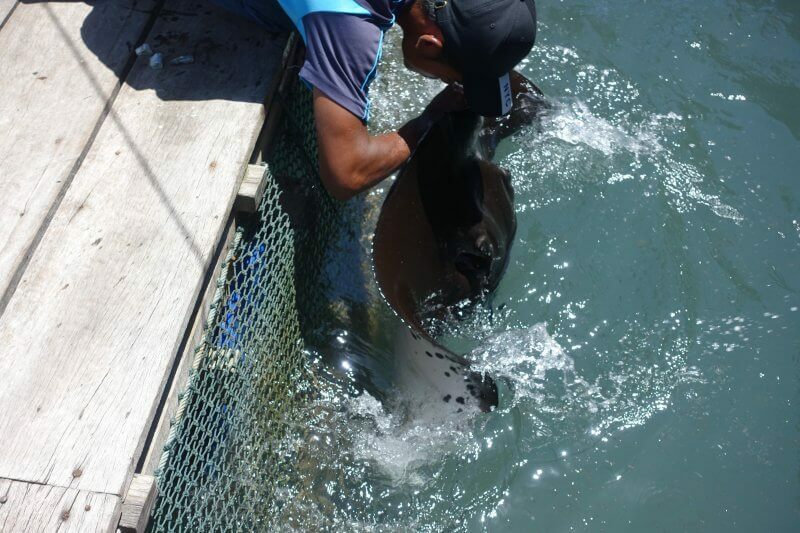 Huge manta ray. I doubt this one’s for eating though. Back at shore, the driver was waiting for us already and we were soon back at the hotel. Or at least it felt rather soon as we fell asleep. The afternoon was slow, and we lazed a little in the room, a little at the pool, and a little at the mall next door. As dusk drew nearer, we finally got ourselves ready for some exploring again, now to Eagle Square. Open hallways behind Eagle Square. 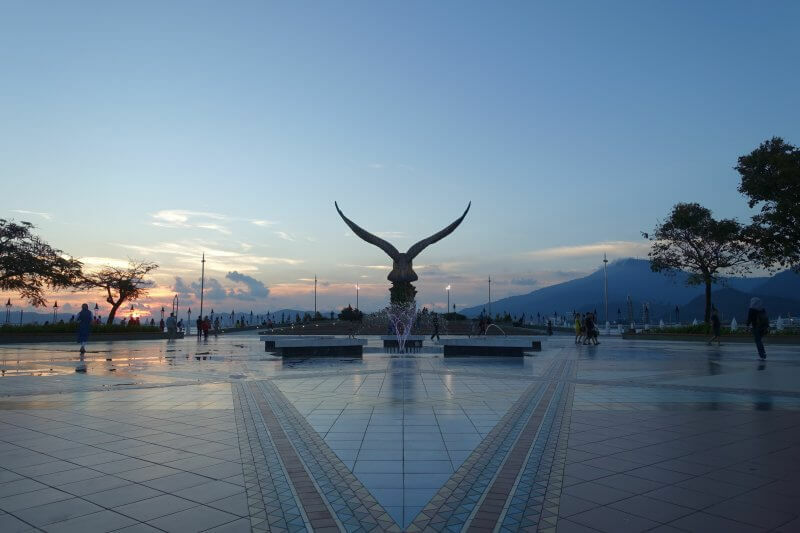 Probably the other most recognised symbol of Langkawi, the massive eagle statue at Eagle Square. Lots were here for sunset. So were we. 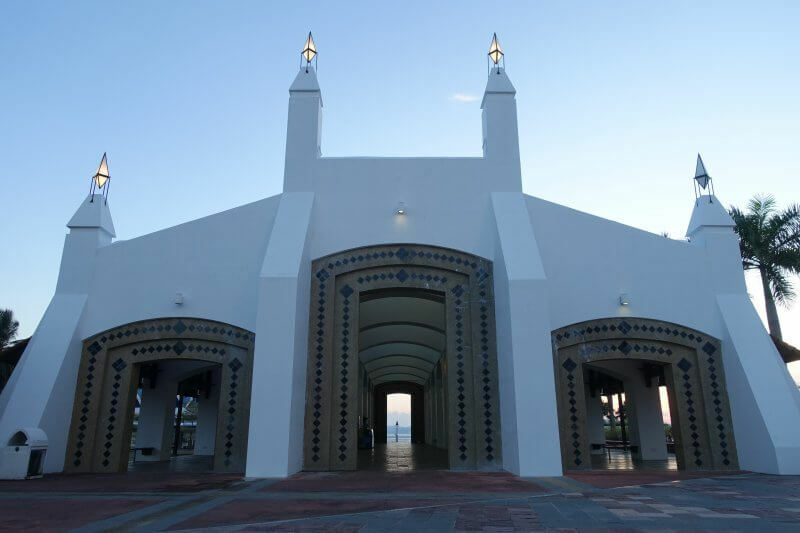 Another icon of Langkawi, from the back. From the front of the eagle statue, we watched as the sun slipped slowly away, behind the mountains in the distance. 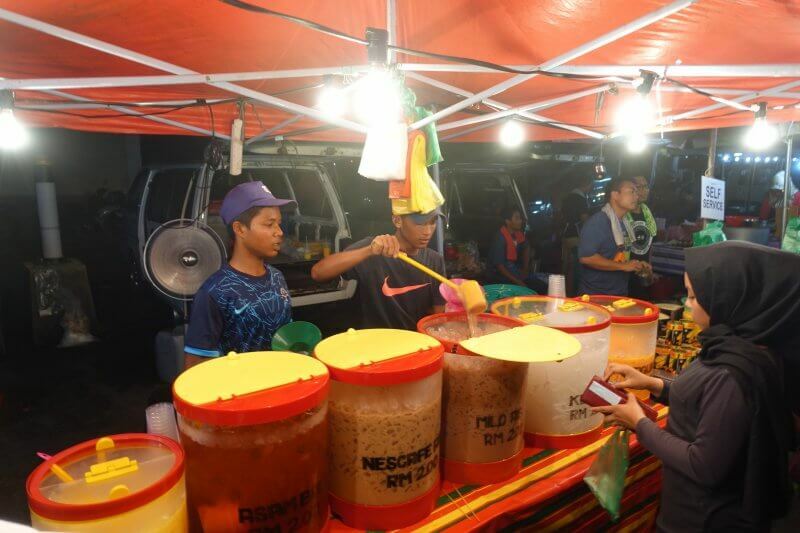 When the sun goes down… It’s time for a night market! 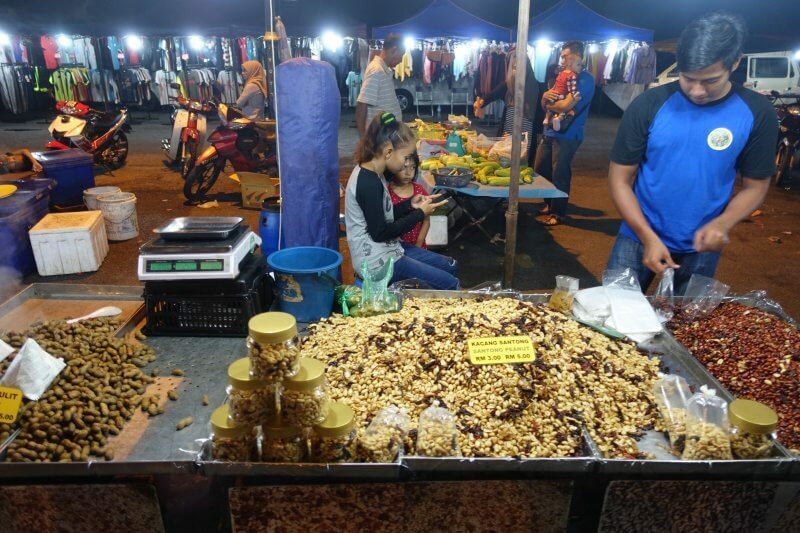 At the Kuah Town Night Market, which happens every Wednesday and Saturday night, you’ll find a wide variety of snacks and local food, at affordable prices. 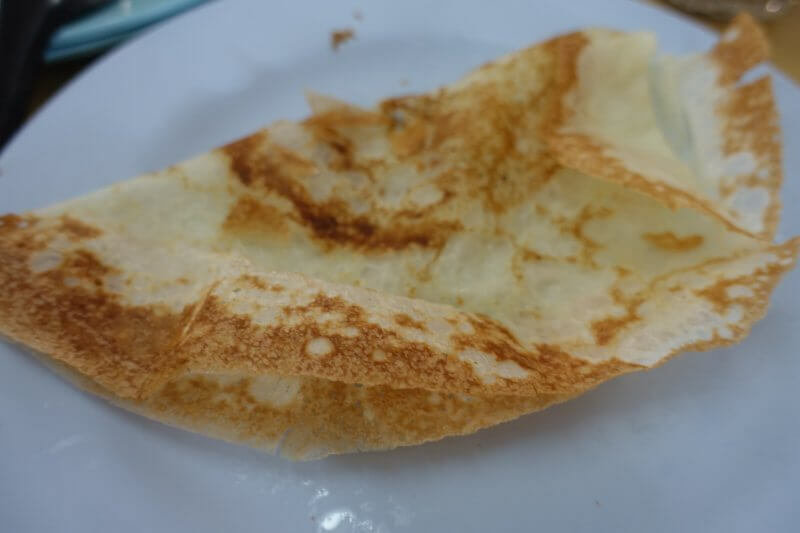 Some steamed rice noodles pancake, which goes with coconut and raw sugar. The drinks, looking a little suspect. My friend had something and was fine though. And so many other delicacies, grilled, fried, roasted and stewed. One of the more memorable ones we had was similar to murtabak we have in Singapore, but the filling consisted of a thick meat patty instead of just shreds of meat. 5USD is probably enough to get you satisfied with a selection of goodies. 10 will likely cause a food coma. 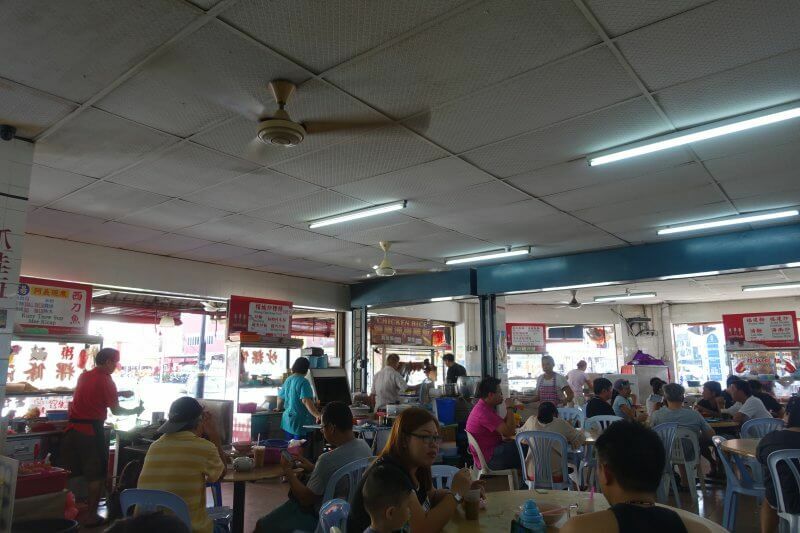 We started our final day where we ended, at Water Garden Hawker Center, a stone’s throw away from Kuah Town Night Market. Another round of binging on local food. Without burning a hole in the pocket. Food was not mind blowing, but nonetheless enjoyable. Lots of food to pick from. Apom, light and airy, like a fairy. Fortunately, we were full but not that full, as the ride up to the top of the highest mountain in Langkawi, Gunung Raya, was via a very windy road. 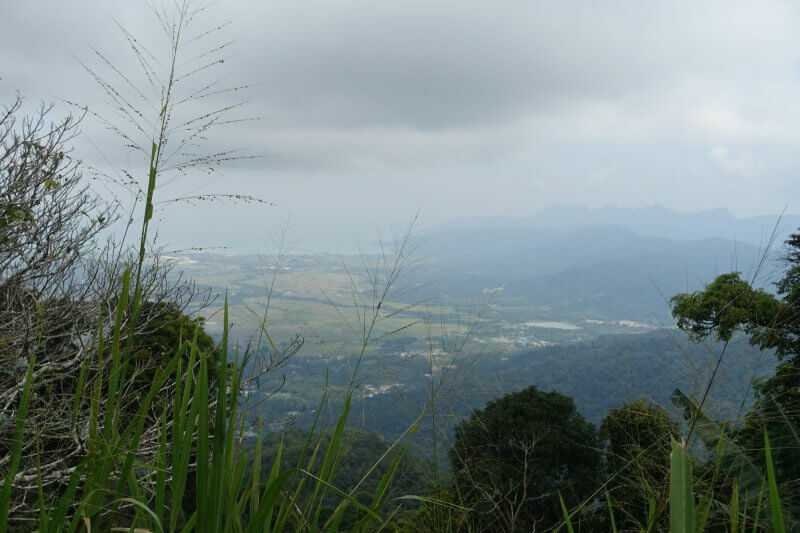 At a leisurely pace, we took about an hour from Kuah Town to reach the summit (881m), where we were surprised to find hardly anyone there. 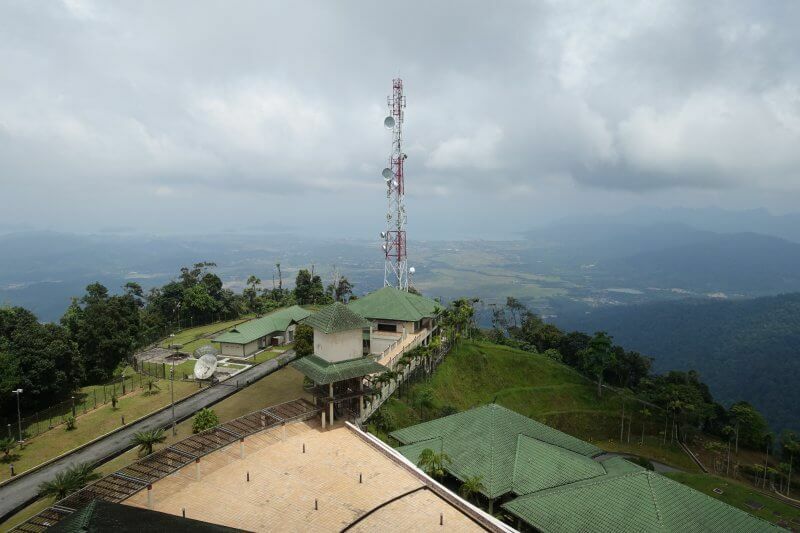 There was a lonely looking resort, D’Coconut Hill Resort, as well as a lookout tower, but otherwise, it was deserted. From the carpark in front of the resort and lookout tower. 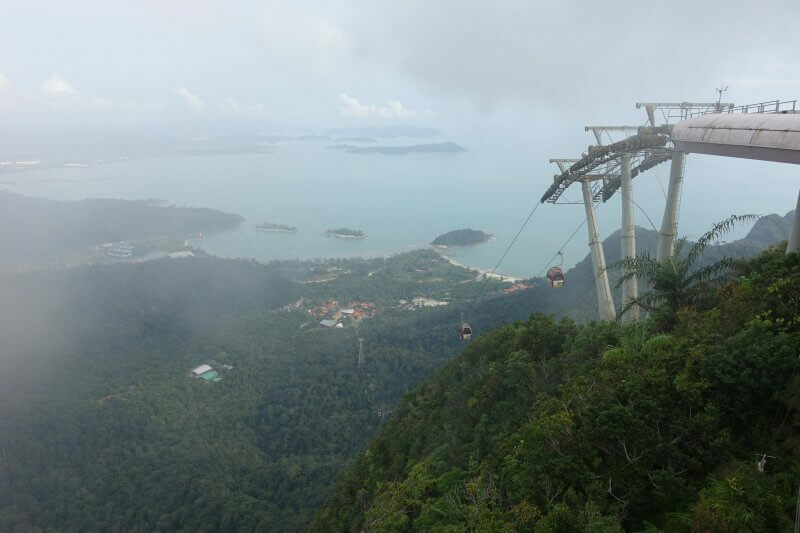 For 10RM, you can access the lookout tower (seen below) and get a 360 degree view of Langkawi. At the top, we found 2 other tourists, and a kettle of coffee boiling since god knows when, with a couple of dirty cups lying around the tables and chairs on the viewing gallery. Still, a really chill place to get away from the crowds. Not that friendly looking with the clouds though, continue on for views after the clouds. And still without crowds. Fresh out of a horror movie. 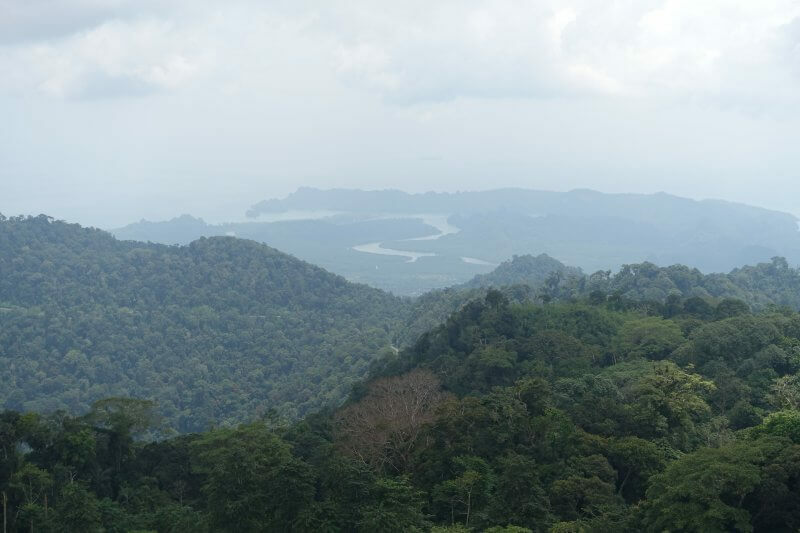 From the top, looking across the lush forests of Langkawi. Another side of the viewing deck, peering across the end of earth. With some chairs lying around and with hardly any other visitors, it was easy to chill at the top for some time. On the way down, stopped at one of the openings in the vegetation for a view of the fields. 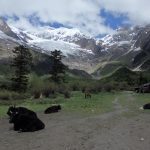 Though there isn’t much traffic on the road to Gunung Raya, it’s best to take it easy, not just because of the sharp bends and steep drop off on one side of the road, but because monkeys and other wildlife may get be the road. It was time for our final stop, before lunch and then the airport. 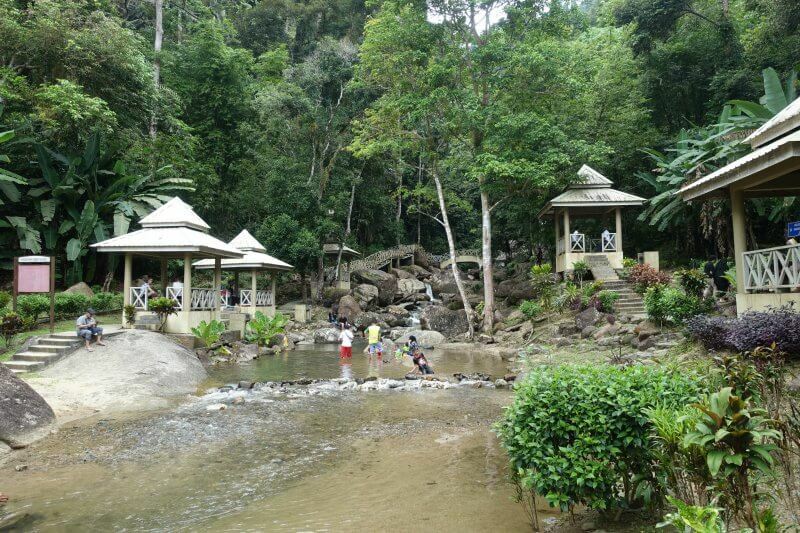 Durian Perangin Waterfall, at the foot of Gunung Raya, about half an hour by car from the summit, is a family friendly place to get some free water fun. Kids playing in the calm waters near the end of the waterfalls. 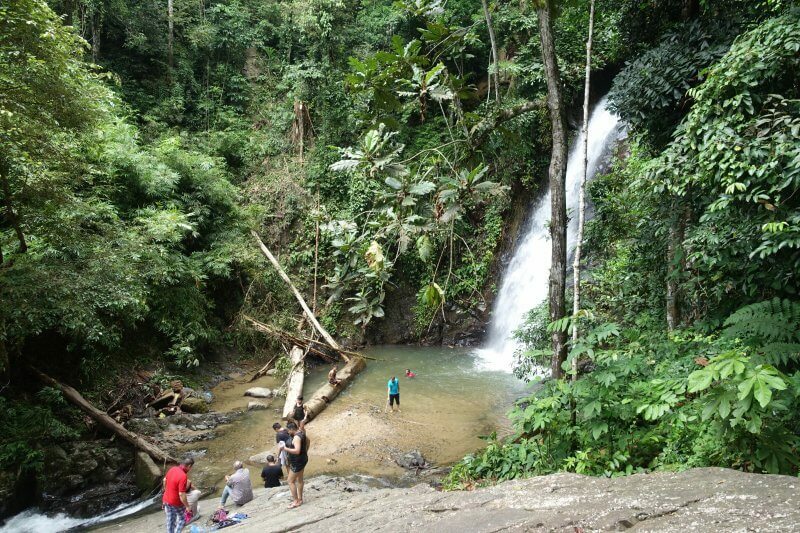 A short hike up a flight of rock steps will get you to the highest waterfall of Durian Peringan. From there, brave the steep walk down a rock face and take a seat on the huge log lying in the face of the waterfall, and soak that calming scene all in. Literally. 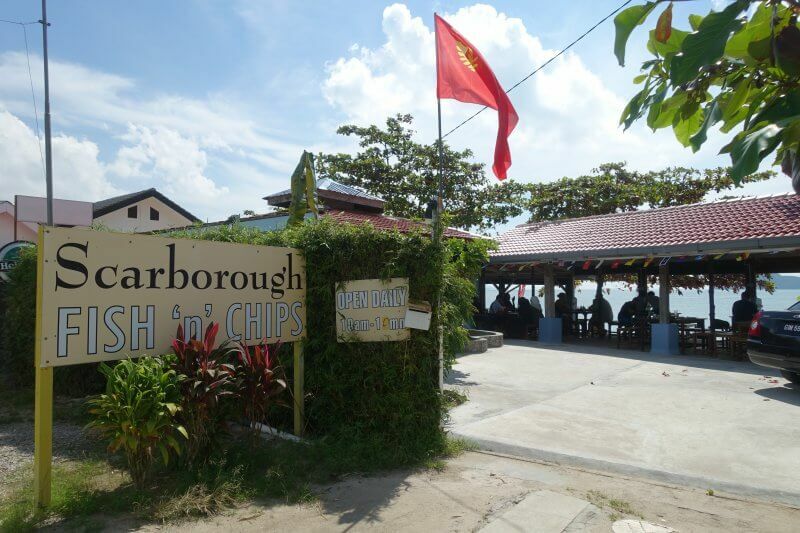 After a 10 mins drive, we were on Tanjong Rhu beach, to look for the famous Scarborough Fish n Chips. 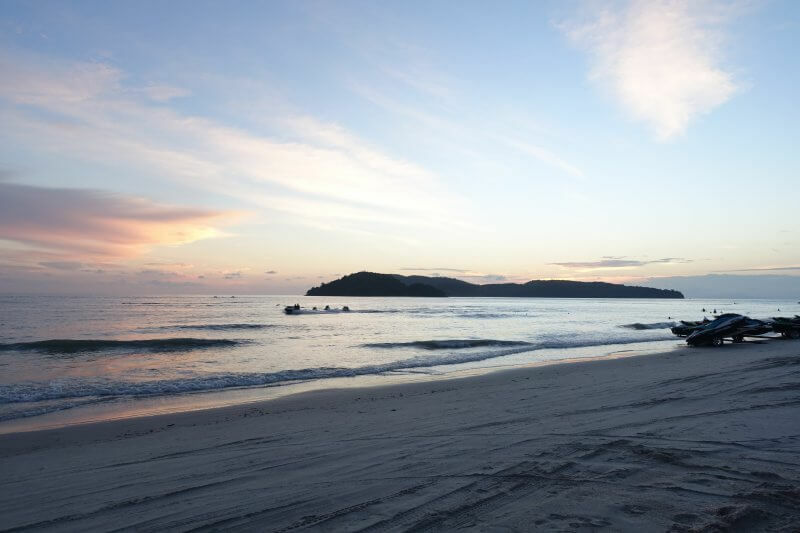 Like most other places in Langkawi, this wasn’t crowded, and so was the white sandy beach in front of it. Scarborough Fish n Chips. Laid back atmosphere, great views. Would have been nice to spend the afternoon there, enjoying a beer or 2. Unfortunately we had a flight to catch home. 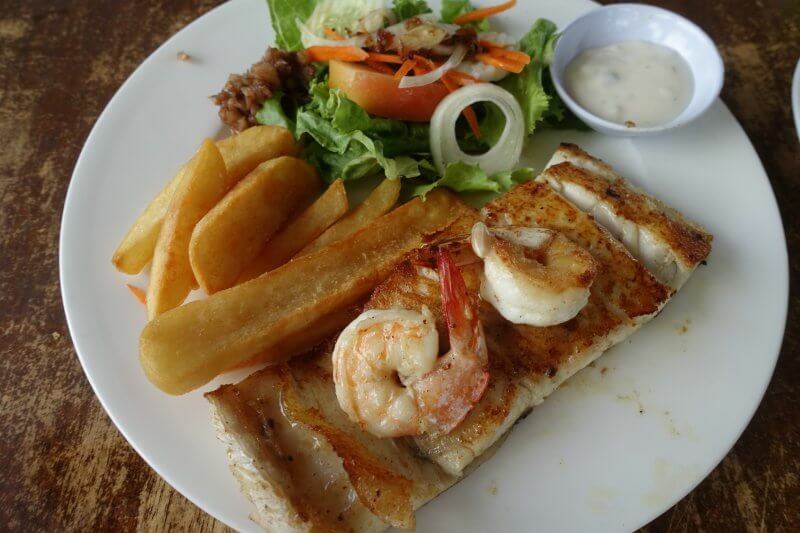 Freshly prepared fish n chips. 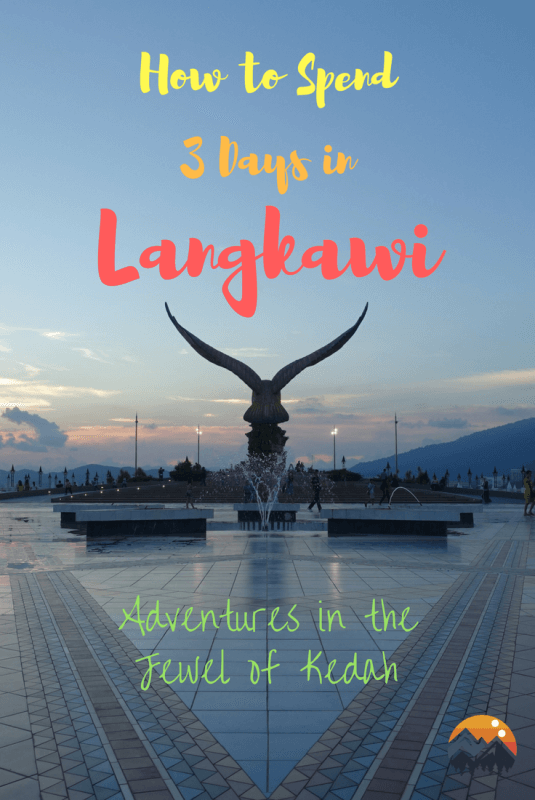 With that, we were done with our Langkawi trip! Made our way to the airport, where representatives from the car rental company were waiting to pick the car up (at no extra cost! 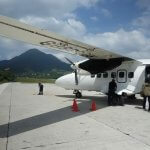 ), and soon, back to reality, working for our next trip. 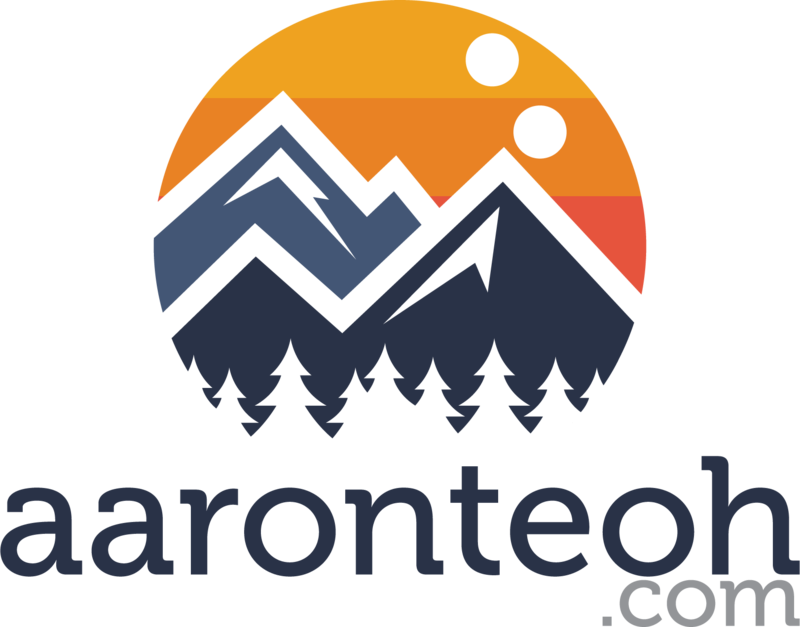 Mind to share which tour company that you engaged with? Thanks! Hi Noelle, the company is Auntie Travel and Tours, they can be reached via Whatsapp at +60 19-417 0843.